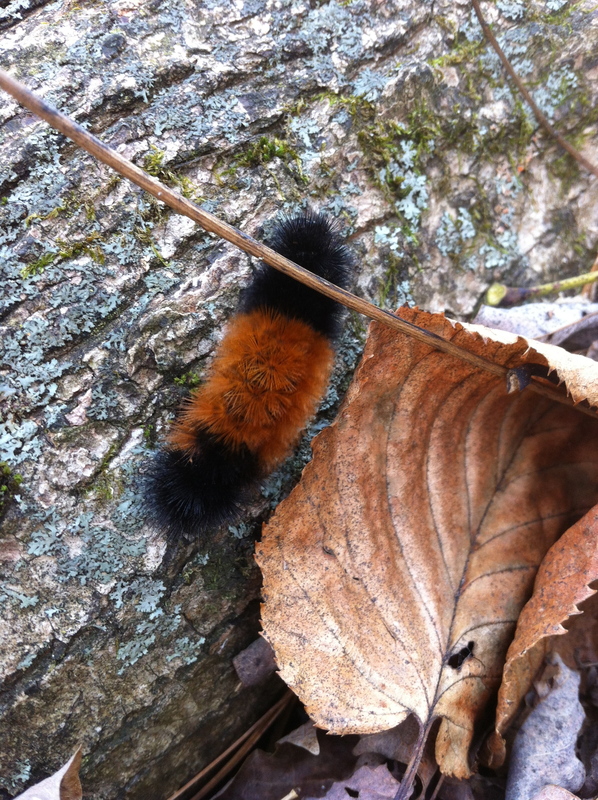 A wooly bear caterpillar looks for winter refuge along the ascent. Note: This story happily continues in a later post. We went exploring this weekend, off the workaday beaten path and on an ancient predecessor. Upon the shoulder of an out-of-the-way road stub in Northfield, Massachusetts is a dilapidated historical marker announcing the viewer is in the presence of King Philip’s Hill, a significant landmark in the unfolding of the mid-17th century War bearing his name (more properly, Metacomet). I can let you do the research; the story you may unravel is long and deep. 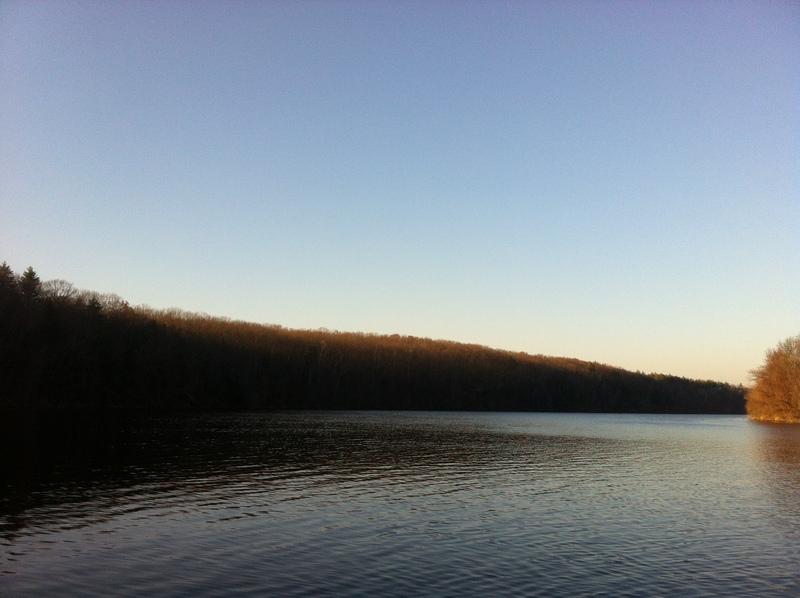 It is a strangely calm and evocative place: a glacial drumlin-like river terrace immediately adjacent to the west bank of the Connecticut River rises precipitously 80 feet from the river plain, its steep sides of perhaps 45 degrees or more battering a strikingly flat, level top. This natural formation was a fortification of the region’s indigenous people, the Sokoki band of the Western Abenaki, joined lastly by the nearby Pocomtucks and others, across the water from one of their great villages, Squakheag (an alternate name for the tribe also), and the fertile bottomland of Great Meadow. 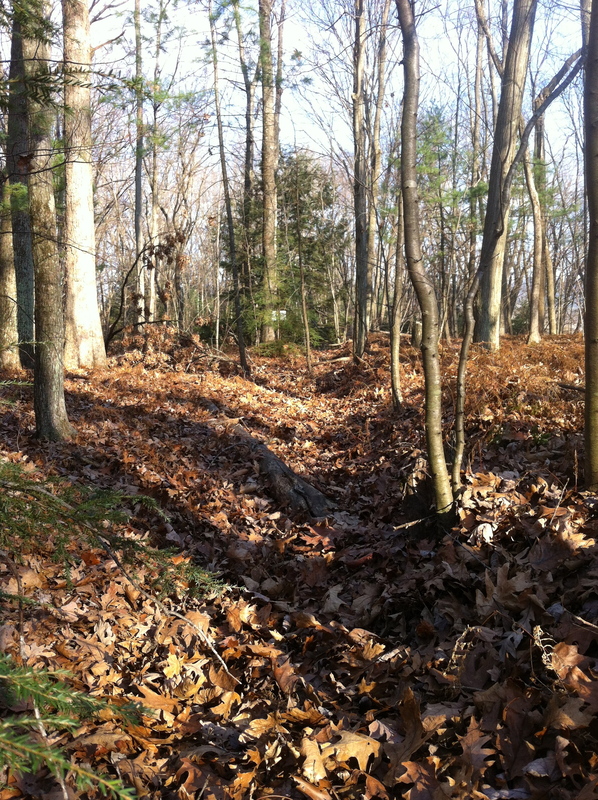 The remains of several ditch and bank fortifications are still to be seen striking in a straight line through the open full-story oak and hemlock forest. I thought about the lives and events this quiet place had witnessed and listened for their ancient echoes, faded away nearly 350 years. In the winter and early spring of 1676, at the height of the New England tribes’ effort to drive the English settlers back from their homelands, Metacomet, second son of Massasoit and grand sachem of the Wampanoag, had encamped here with his massed alliance of warriors to prepare for raids and battle. It is estimated that there were 3,000 allied tribe members gathered with him in the pine woods beside the great Kwanitekw, the highwater mark for his furious effort to drive the interlopers back to the Atlantic coast. Hunger and weather proved a greater foe than the English that fateful year. It was the beginning of the end. 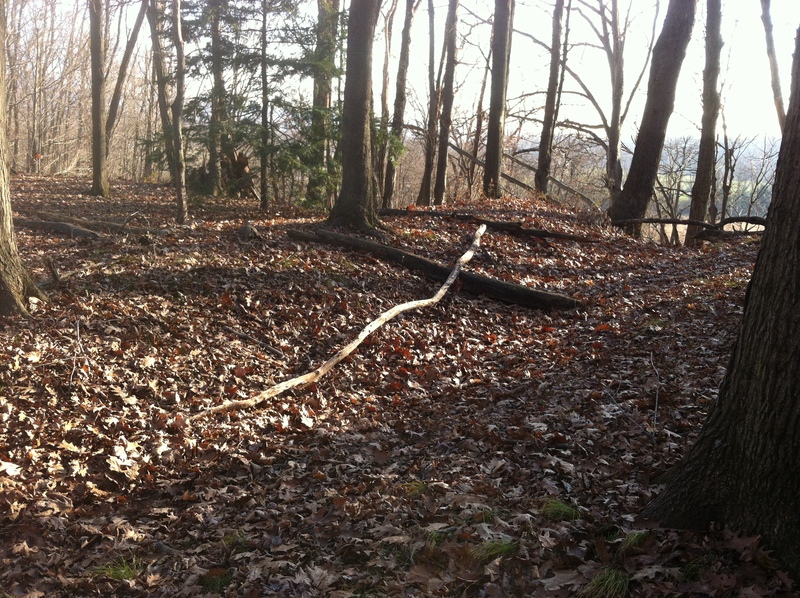 The southwesterly end of the first trench, on a rare warm November afternoon. The easterly end of the second and much longer trench, north of the first. The broad sweep of the Connecticut below the hilltop site, provider of food and passage.